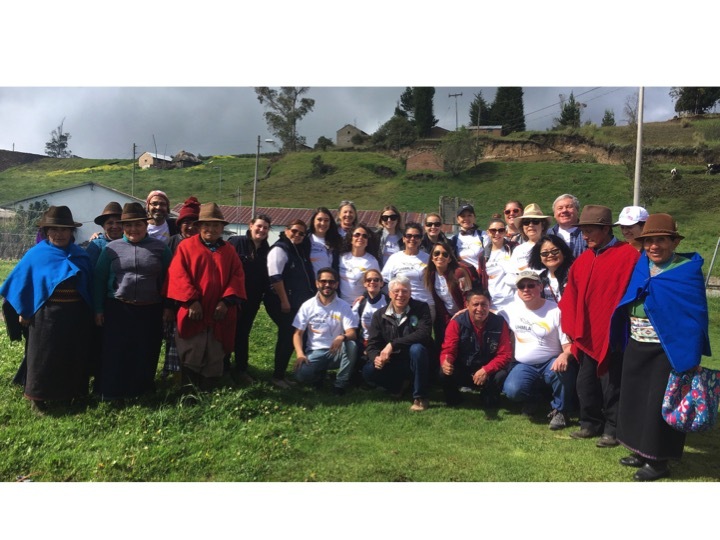 UHMLA got to a great start in Ecuador. We had connected with FIBUSPAM, a foundation created by Paul Martel, from Connecticut. 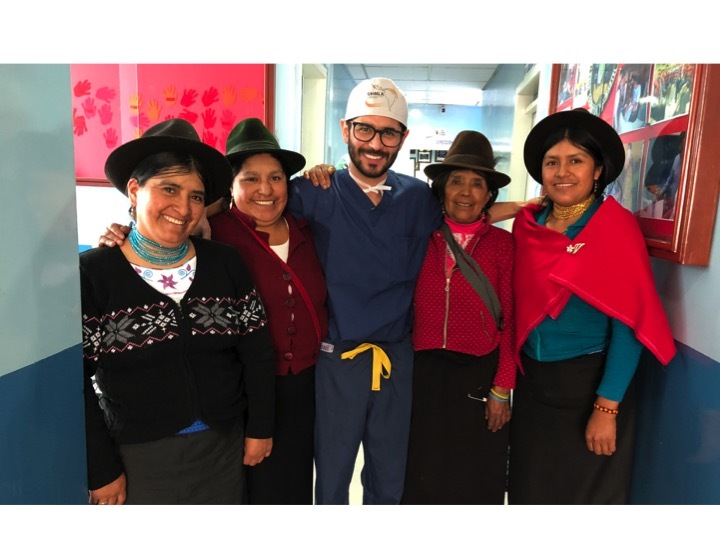 After participating in multiple medical missions in Latin America Paul settled on devoting his efforts to building a “Clinica” in Riobamba. 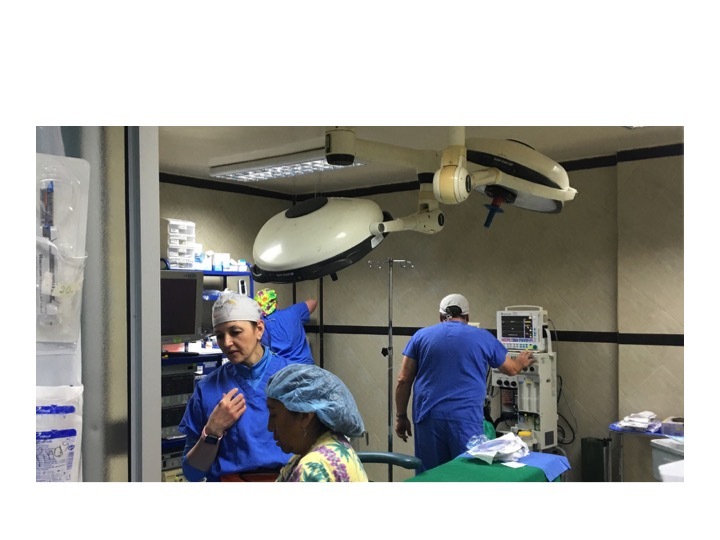 This Clinica has two operating rooms equipped for laparoscopic, ophthalmological and gynecological surgery. 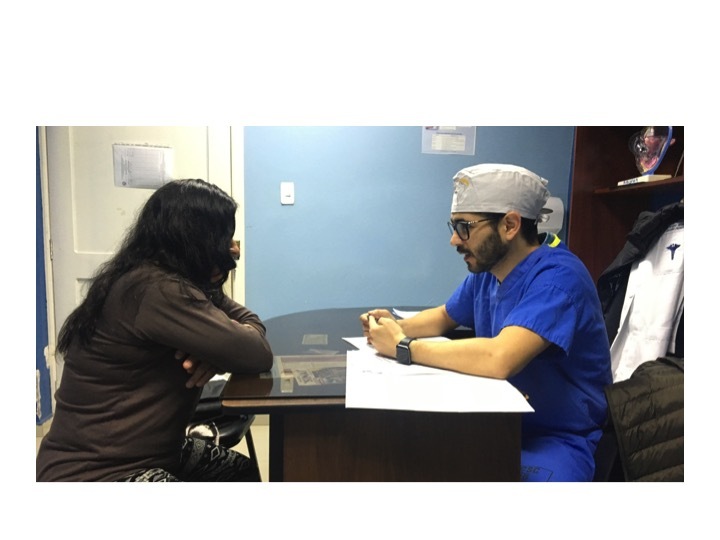 Based on the needs in Ecuador we included one of our plastic Surgeons, Deowall Chattar and another general surgeon, Vinicio Medina, along with Rolando Rolandelli, and a PGY-III general surgery resident from Morristown, Gina Cavallo. The anesthesia team included Gerry Lefever, Anita Galacki and Kristi Scacco. The OR nurses were Kristyn Fabiansky, Melahat Ayhan and Barbara Huff, with Tara Gonzalez and Ruben Millan as circulators. The Post-Anesthesia team was made by Valentina Salvador and Yuri Jaramillo. Suki Dewey was in charge of the reprocessing of instruments. Maggie Claudio and Mercedes Rolandelli worked on directing patients and families through the process. We left Newark at 6 AM with the usual 19 duffle bags with about 45 lbs of supplies in each. We had a long layover in Miami and finally arrived to Quito at 8 PM. A bus was waiting for us to take us to Riobamba where we arrived at 2 AM, which made a door-to-door trip of 24 hours. We climbed to 11,000 ft., most of us preloaded with Diamox. Saturday we caught up with lost sleep and in the afternoon we toured the FIBUSPAM Clinica with Paul Martel, David Guacho, Olga Zapata and about 10 more physician, nurses and administrative personnel of FIBUSPAM. The Clinica is very well kept and equipped. The cleanliness in every area is very impressive. On Sunday we did the typical screening of patients with many no shows. 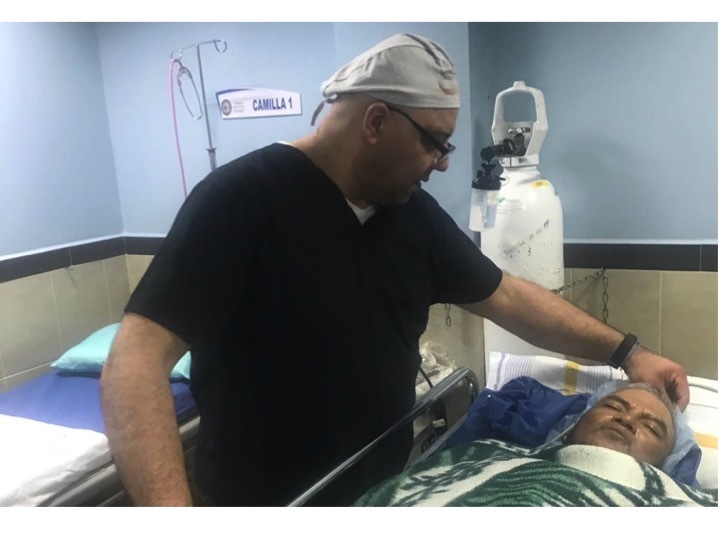 Turns out that Ecuador is getting close to regional elections and political campaigns draw many people who otherwise would be seeking medical attention. We saw 34 patients and planned on surgeries for Monday, Tuesday and Thursday, leaving Wednesday to go to the community and Friday for “add ons”. During the week we screened more patients, had more cancellations and added more patients to the schedule so we finished with 36 surgeries: 19 general and 17 plastics. The extraordinary cases of this trip were microtias, a congenital malformation that results in underdevelopment of the external year. Children are very affected by their physical appearance and reconstructive surgeries by local surgeons are not an option. The reconstruction is done in stages using cartilage obtained from the lower ribs. 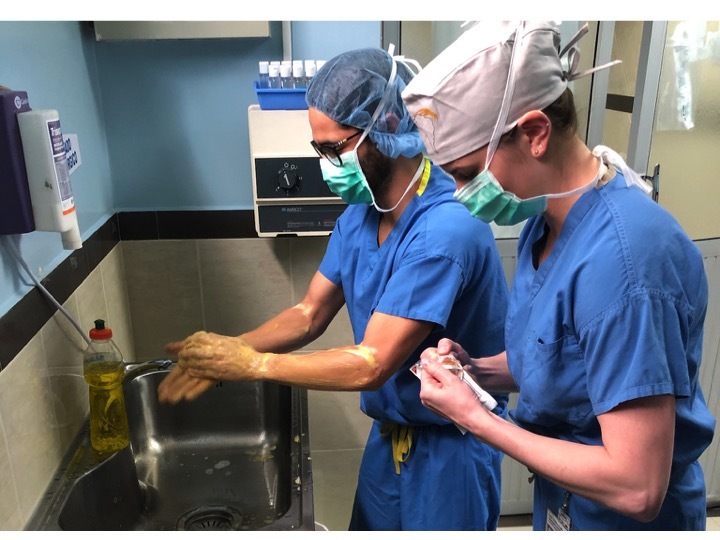 Our plastic surgeon, Dr, Chattar, working in collaboration with a local pediatric surgeon, Dr. Enrique Minta, did two of these cases, 6 hours of surgery for each. 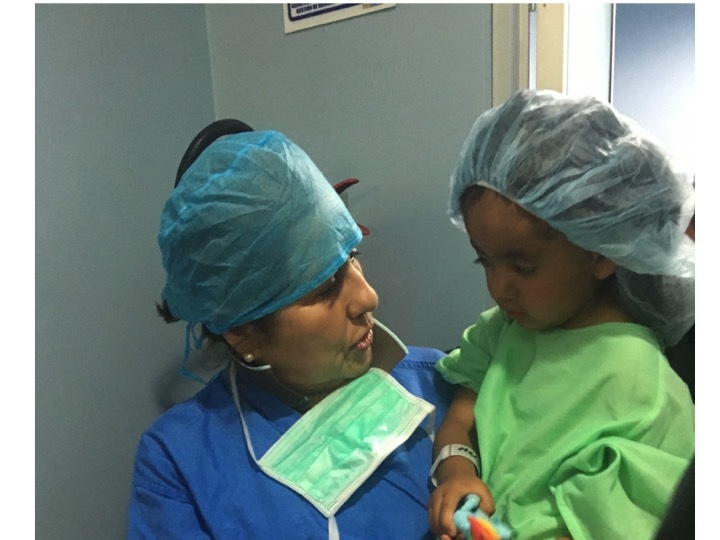 By the end of the week Dr, Minta saw one of the two patients, a little boy who came with a little mirror to the first postoperative visit. When the dressing was removed from his reconstructed ear he burst in tears and hugged Dr. Minta. He told us that out of the 7 patients he followed in the clinic this little boy had the best result and brought him down to tears as well. In general surgery we encountered the typical advanced stage of chronic cholecystitis that makes removal of the gallbladder difficult and risky. Fortunately all patients recovered well from surgery. No more than half of the team members had worked together, in other missions or in Morristown; however, by Thursday the team was in sync as we had been together for many years. The feeling of this transition from nearly strangers to the strong bond a missionary team is indescribable and the second most rewarding part of the trip after the help we provide to the patients. Since this was the first trip of UHMLA to Ecuador we asked for a tour to a community from which patients came to the clinic. We were driven to Convalescencia a village of about 35 people, most of them elderly. We brought 38 baskets of essential food for them. We visited the home of an 87 year lady who could not ambulate and then attended a gathering in the center of the village where we sat on the pews from the little church and shared a meal and exchanged thoughts and emotions. Riobamba turned out to be exactly the place UHMLA aims to find in Latin América: lovely, hard working people with no access to healthcare. Just like we have seen in La Esperanza, Honduras, Guatemala City and Yantaló, Peru these people have the ability of conveying their appreciation for the help they received without the need of words.